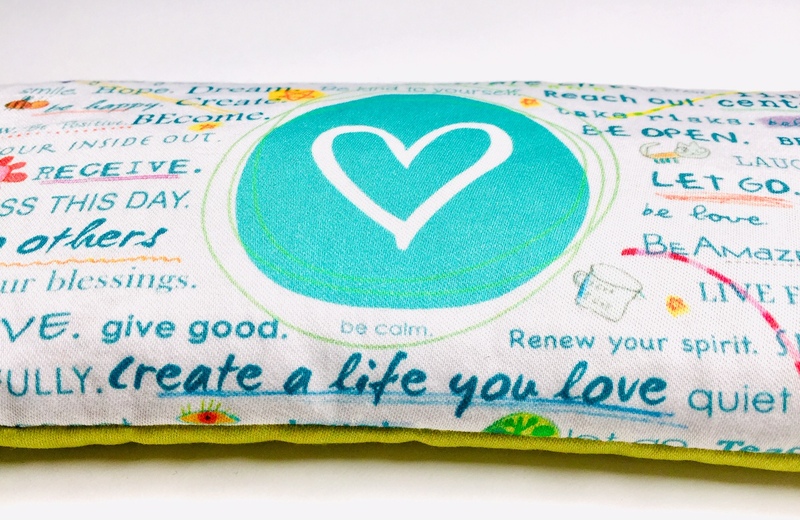 Creating a Life We Love – Together! Not sure where this will lead to, but it’s something I feel driven to do. This is my intention for 2010: to reduce the amount of mental, emotional and physical “clutter” in my life, so that I can create more s p a c e for what truly matters. Would you like to join me? I don’t have anything formal set-up, as I think this year-long project will organically evolve and define itself. So all I’m asking is that if any of you are inspired to reduce clutter in your life, so that you can regain that much needed space for all the things you love – those things that make you feel more alive – then come along. Let’s do this thing together! Let’s put ourselves first. Let’s put our art first. Let’s put our hidden, quiet, secret dreams first. Let’s be bold. Let’s live more fully. Let’s be our true selves. Let’s let go of MORE so that we can find that place, that s p a c e, where our hearts are open and free. And, let’s share our journey. You are invited to use one of these badges on your blog to help get others involved, or simply as a way to post a visual reminder for yourself. Feel free to link it to this post. 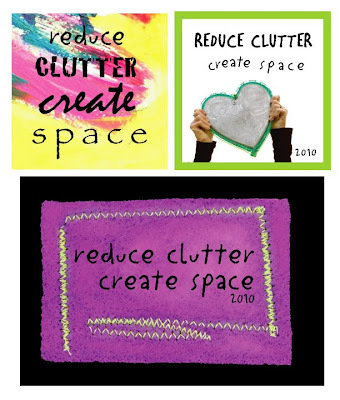 Also, let me know if you plan on joining me for this “Reduce Clutter; Create Space” year-long challenge. I will add your link to the sideline of my blog. If you aren’t interested in participating, yet, want some tips on how to reduce clutter in your life, I will be posting regularly about this topic, so check back often! Also, if you use Twitter and will be sharing about your reduce clutter journey, add this hash mark: #reduceclutter to your tweet so we can read each others posts! 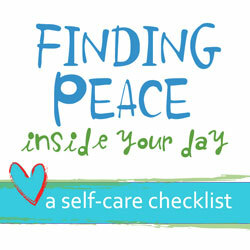 As of January 4, 2010: I’ve added a Twitter “Reduce Clutter; Create Space” list. Let me know if you want to be added to it. Also, you can join this “challenge” at anytime throughout the year. As of July 12, 2010: Nearly 70 people have joined the challenge. We all have stories to share and through support, we are connecting, learning and growing. It has been an amazing 6 months so far. Let’s continue to create more space – one step at a time. Are you next? I'm all for creating space to make room for more creativity. I've posted your badge and will participate when I can! Cheers to a year filled with lots of creative adventures. Great idea, Shannon. Making your intentions public helps keep you accountable. I have found that people who like to make things struggle with clutter because there are so many great tools and materials they want to have. It is possible to be creative and keep clutter to a minimum. I look forward to following your journey and encourage people to share their ideas, too. I've already got a head start, but have a LONG, LONG, LONG way to go…………..
Syncronicity – this "What is working" and "What isn't working" or "What worked in 2009" and "What didn't work in 2009" was asked in a community where I am involved. That's wild to me to see it twice… a little more than a year ago I set a goal on 43things.com that went like this "eliminate the stuff from my life which doesn't fulfill me spiritually, emotionally or creatively" – that included more than just the stuff in the corners of my house. This Christmas the gift I gave myself WAS decluttering. My house looks better than it has in years and tonight I am having people over for the second time in a week after having no one over for years. Amazing! I'm glad to be a part of this. I especially like, "Let's put our hidden, quiet, secret dreams first." I have wanted to bake pretty cupcakes forever, but so scared because I'm a kitchen novice. But I've taken my first steps and it's so exciting! Let's do it!!!! I have been thinking about this very thing!!!! Please sign me up! Thanks! I changed the button!!! will be joining for sure! Oh, I think I am going to give it a try! I know it should be done, (and I did a tiny bit of decluttering earlier this year), but I am SO resistant! So count me in … Eeeeeeeek! Words can't even describe how excited I am that you are all willing to try to reduce "clutter" so that you can make space for the most important things. I am honored to have each of you join the journey with me. Take a look at the "explorers" list. It continues to grow. 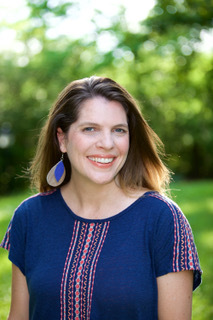 Feel free to send me an email directly anytime you post about your clutter journey and I'll be happy to share it with the group. I also created a Twitter list, so for those of you who use Twitter, we can connect that way as well. Feel free to use the hash mark #rccs when posting about the challenge. I will continue to share tips, reflections, struggles etc. about my own journey, and I know we will ALL be a source of inspiration to each other. I appreciate each of you so deeply. Declutter is my #1 goal for the new year–I'm in! I found you thru a friends recommendation. I just set up my first blog for 'paper'. not to wiffy at the techno stuff but I will follow along here and try to 'badge' thing and the sharing! Thanks for the space – you came at just the right time for the theme I have been working up to in 2010! and the list continues….you've all been added. welcome, welcome! This is a great idea and I'm in for joining! But I can't seem to find the way to put a badge on my blog! HELP! Ok, I have to admit you got me so excited about this, I have ordered drawers for my pantry, so I can organize better. Then I cleared out two kitchen junk drawers, organized my recipes, and put them in there. Then, cleared out the space under my sink in my bathroom. I got rid of a heart shaped plate. Later, I wanted it back. MY personal challenge will be to let go….and mean it! This has been heavy on my mind,the declutter word.I just have a hard time letting go of my supplies,you never know when you might need something.I'm trying to be aware of what I use and what I just keep and don't use.This is what I will be aware of this new year. I'm in…. This was something I've been wanting to do anyway. This comes at a perfect time in my life. My intention for 2010 is "Yes" and I say a big yes to your challenge! I'm in! I have been working on declutter for a while and I think this will keep that process on track. And I will use the hashtag on Twitter (@Soulspackle), but due to an unresolved Twitter issues, my tweets aren't indexed in searches and won't show up in a search for the hash tag. Silly, but true! I do believe you are just what I need at just the right time!! My blog is http://www.minetothine.com! I'm off to add a button! How exciting…the list continues to EXPAND. Exactly what will happen to us with the more space we create. You've all been added. Spread the word and invite others to join. I finally did it! Let's start decluttering! I am looking forward to this, it is time for me to find the esstial items and get rid of the rest. arteveryday on twitter, but still learning it. you've all been added! ni, did you get my email? I'm in and the reduction has begun. patrick-you've been added and i'm happy you've joined the list! i'm in! i have been clearing out my studio – not just my house – i have been a professional artist for years and the accumulation is making me crazy. many people know me for my frequent Somerset Studio contributions. anyway, i have lots of studio fodder to share – anyone interested? once you get your spaces clered out to make art – you might need supplies – i have got them…. you can go to my etsy shop – i sell big 7 pound boxes of studio fodder (believe me 7 pounds is a lot) – papers, paints, vintage photos,fibers, projects i have done – etc. for $20 each. i teach paintovers – there are many in each box. Hooray, I'm in! I found you through Nina at Voices In My Big Head. At various times of my life, I've felt weighed down by posessions. Recently I was forced to tear out my kitchen and I vowed to keep only what I used and loved. Amazing! My cabinets have empty shelves and I can see every single thing in them. It's exciting and liberating. What a great way to start the year. Let's all keep it up. I'm working on my home office now. Wow, photo cabinet, linen closet, and then clothes closet next. I can't wait! You all have been added! Gayle-Your link didn't work so I wasn't able to get a hold of you or add your link. Please let me know if you have a website/blog or twitter name that you'd like me to add. I love what you said about feeling "weighed down by possessions." I hear ya…and I'm dedicated to keeping this up, too. Thanks to all who've joined so far! This sounds like a great idea! If I'm not too late please sign me up. Got you! Happy you've joined us! You can join anytime. Me too, I really, really need to reduce some clutter in my life right now. I'd love to join as well. l came upon you quite by chance and love your blog. i took have decided to declutter and your heart sign says it all. I too have decided to put my ART first and go for it. I am most definitely in for the year! I have fought physical and mental clutter for the last several years and am bound and determined to break free of the cycle this year! I am fully putting my intention out into the universe to find what is really important to my heart and soul and my family and get rid of the rest and not allowing it back into my space! Sign me up! you've all been added up to this point. soooo cool. How do you grab the button? i would like to join you on reducing clutter. i'll try to add your badge to my blog. i'd already started before the end of the year. rid of magazines and books – off to library and DAV. half of wardrobe – off to DAV. yes!! suggestions would be great too. you've all been added up to this point. Please add me to this as well! This fits so well with the word I've chosen to work on in my life this year, harmony. Thank you. ooooh – what a wonderful idea! I am always trying to de-clutter everything as I don't like clutter at all!! Since 2 years I know that I have ADD. I gave birth to a daughter and stopped working. But I still get lost and miss my structure. I have many creative ideas, and would like to create space. Today I received a message that I now weekly, for half years, getting a coach home. Your blog radiates energy and positivity out !!!…. I love it !!!!! Count me in! I am in a big transition in my life right now, and need some reminders to stay focused on what brings me joy. you have all been added. thanks for joining! Count me in too! My goal this year is to become totally clutter free! Cool, I finally figured out how to add a link to this spot. I'm in. Just came across this blog from the blog above (Its Lily). I am just at the point where I am about to get rid of a bunch of stuff. In fact, I already took a bunch of "before" photos of the areas that I want to work on. Now, I just have to get at it! Easier said than done. But, I like being able to see what others are doing and how it is going for other participants. Please add my name to your list and thanks for initiating this project. Count me in! I've actually been working since the beginning of last year on getting rid of excess stuff; it's taking a lot longer than I thought it would… But maybe with a little motivation I can kick it in the rear! you've all been added. yipeeeeeee. Need to declutter since we are going to live fulltime in a bus! you've been added, mama jen! I've been working hard this year on decluttering and cleaning and organizing so I can find the stuff I want/need to keep – and now I find this – so I'm definitely in! hmmm….not too sure if my comment will be posted or not. I subscribed, then unsubscribed by accident – oops! Anyway, I think this is a wonderful idea and I'm totally onboard, but I need help with the badge! I'm not too tech savvy! And now I'm off to check out some of the other blogs mentioned in these comments. I am a perpetual cleaner/clutterer. My husband will come home to my excited and almost delirious proclamation, "Look how clean and organized my room is. I LOVE it this way" and in his eyes I can still see a glimmer of a sad reflection. Then soon, very soon, it's like the movie Ground Hog Day. I wake up and I'm back in clutter HELL. PS I found you through Nina at Voices In My Big Head. just found out about this, and I am in! this is so great as this was my number one resolution I have set out to accomplish. Doing good so far! But – each time it gets better! I found that I have to put my brain on auto pilot and focus 100% on the "outta here" voice in my head. I am so proud of myself when I can stay focused! I have not been successful with the badge either, but I am NOT tech savy. But right now, I do have a pretty clean and organized closet! I'm in! My own and children's wardrobes are done, work space will be next. Thank you for the inspiration Shannon. I would love to participate in this challenge! I really need to do some de-cluttering in my life. Yes!!! This is me 100%. You're so inspiring in ways you can't imagine! Thank you! I've added you add! Christiana- email me if you have a blog you'd like me to link. Or I'd be happy to just add your name. Let me know! I love the program of June. My computer and email inbox is a junkyard! !